The weekend before Easter my uni friend Sarah came to visit me in Madrid and after a few days of sightseeing there we headed on the high-speed AVE train from Madrid Atocha to Valencia Joaquin Sorolla. Just 90 minutes later we were by the coast and could smell distinctly salty air and a low sun in the evening gave us the perfect seaside feeling which I haven’t had since at least last November when I spent a weekend in Boulogne-sur-Mer on the north coast of France (read my blog posts here and here). I adore the sea. I grew up near the sea on the south coast of England and one thing I dislike about London and Madrid is their distance from the sea. Madrid especially – it’s such a shame that it’s bang slap in the middle of the entire Iberian peninsula. So after travelling down on the train thanks to GoEuro.co.uk, an excellent website where we booked our tickets, we spent two nights in the city at Valencia Flats, courtesy of TravelZoo.com/uk, a website offering absolute bargains on accommodation and holidays. I’ll go into more detail in my full blog post later this week but we stayed near to the City of Arts and Sciences, which is where I picked up this postcard. Wandering into the City of Arts and Sciences feels like ending a baddie’s futuristic headquarters. The architecture, by local Valenciano Santiago Calatrava, is outlandish and as the complex of six buildings all occupy the same space, they look in tune with each other, but if they were standalone then I’m sure people would cry out for their demolition as they can look a bit hideous. 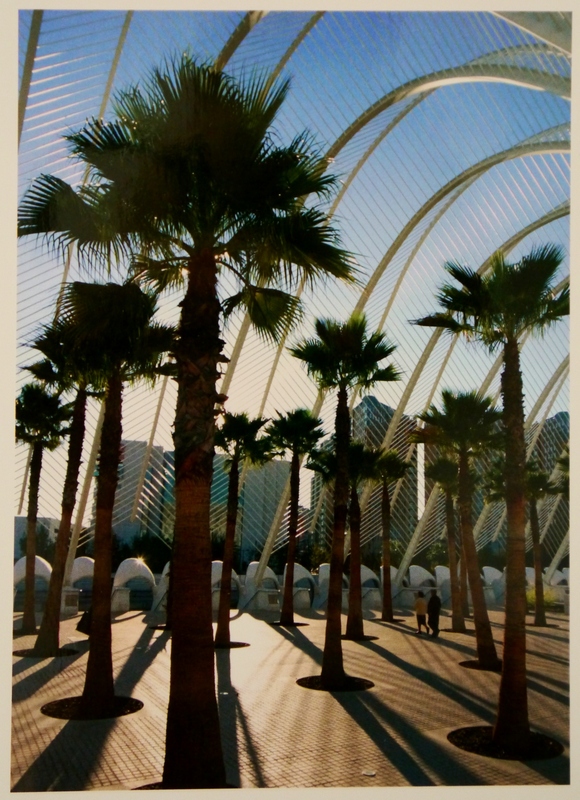 One of my favourite parts was the Umbracle Terrace, which houses palm tress under its ceiling of white bars. Apparently it’s sometimes used as a club which I would have loved! Click here to read my full blog post about Valencia where I’ve written about everything we visited, tasted and saw while in the Mediterranean city. Have you been to Valencia? What did you like most?